Discerning buyers have been placing Mason Rapaport's fine furniture in their homes for the past 20 years. The son of a naval architect and an interior designer, Mason got his start in his father's woodshop, before an apprenticeship in California introduced him to a progressive, more contemporary style of fine hand-crafted custom furniture. "Each object should not only be practical but artistic," says Mason. "When you're buying this kind of fine furniture, you're also buying tomorrow's heirloom." 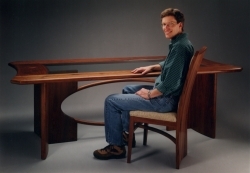 Rapaport exhibited his custom designed contemporary wood furniture across the U.S., from New York to San Francisco. Ensconced now in a turn-of-the-century old mill at One Cottage Street in Easthampton, Massachusetts, Rapaport Designs unique works can be found in homes across the country: from estates in Hartford, New Haven, and Stamford to the cottages of Cape Cod, Nantucket, and Martha's Vineyard. "For me woodworking is more than just a job, it is my lifelong passion. It allows for vast expression of ideas in design," says Rapaport, listing off examples: his coffee tables, end tables, hall tables, kitchen and china cabinets, bookcases for the library, entertainment centers. "Through the use of various kinds of wood and designs, I can create a different atmosphere in any given place: a library, kitchen, entrance hall, foyer, dining room, or living room."